The last time I saw Elvis Costello was the early 80s: In 1981 at the Hammersmith Odeon, on Xmas Eve 1981 at the Rainbow, and a couple of years later at Southend Cliffs Pavilion. To be honest, like Elvis, I liked a drink back then and I can't remember much about any of them (apart from the Xmas Eve gig - which was brilliant). On the evidence of last Tuesday's performance by Elvis and the Imposters - essentially the Attractions with Bruce Thomas replaced - it is hard to believe that it is 30 years later. Elvis had a cold but his voice was still strong, especially compared with others of his vintage (stand up Ian Anderson of the Tull). 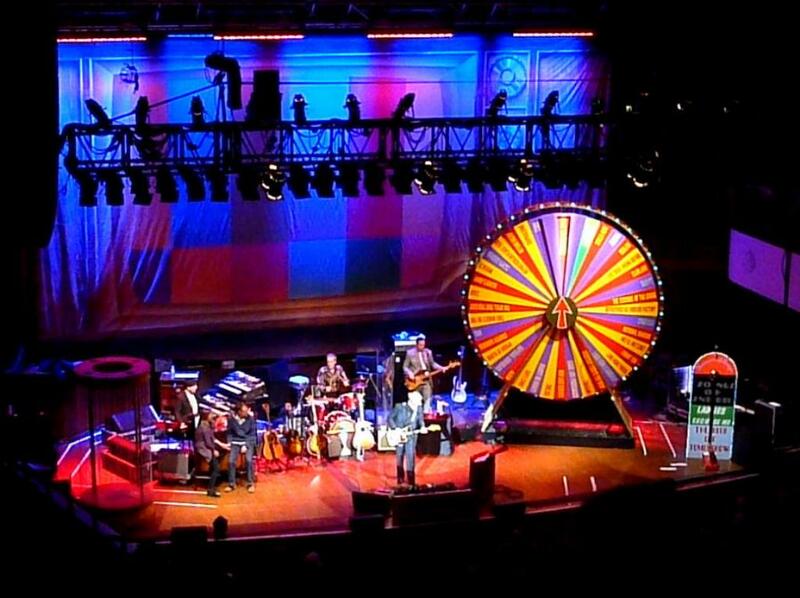 The band kicked off with I hope You're Happy Now, and three other upbeat favourites, culminating in Radio Radio. Elvis then adopted the role of cheery compere for the evening as he invited people up on stage to spin the wheel to select hits from his amazing back catalogue. The band - especially Steve Nieve with his trademark farfisa-like organ sounds and versatile fills - worked hard and could not be faulted; and, apart from strong vocals, Elvis produced some excellent guitar work - including several songs where he delivered head-full-of-acid riffs on his Jazzmaster that resonated around the Colston Hall. People dragged up on stage not only spun the wheel to select the tunes but also drank at the stage bar, danced in the dancers' cage, and took photos with Elvis. The Bristol audience were happy to join in with the repartee and a good time was had by all. Finally, after an impressive set of over 20 songs before the encores, Elvis and the band finished up with a couple of extended encores, including Ship Building and a brooding rendering of I want You (sorry, the visual quality of the following clip is not so good). 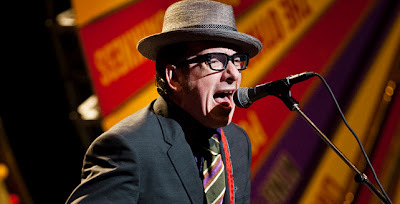 In my previous blog post I mentioned that that my enthusiasm for Costello had waned after his first seven albums - but on the night there were only a handful of songs I did not recognise. At the end of the evening I was reminded that Elvis Costello is one of the most talented composers and performers that we have seen in the past 30 years. I intend to go back to his later albums and investigate them further. There is a live CD and DVD available, recorded in May 2011 in the US and based upon the the Spectacular Singing Songbook - although the tracks included will only partly be similar to what was played at Bristol (by definition). Click to access the actual full Bristol set listing or to access a wealth of information about the Revolver tour.